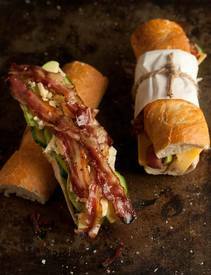 Bacon, blue cheese, & avo baguette! Today is National Picnic Day! Is it warm enough for a picnic where you are? This is one of my fav sandwiches to bring along! I simply love the combination of Bacon, blue cheese and avocado on a sandwich. I add slices of cucumber to add freshness and crunch. Its all about using the best ingredients you can. And, of course, Bacon!